Think green before you buy a bunch of orange & black disposable decorations this Halloween. 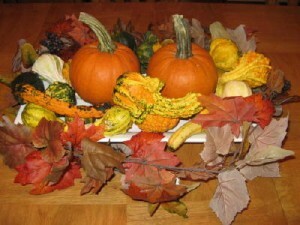 I recommend buying natural items like pumpkins, gourds, straw bales and corn husks, which are all inexpensive, very festive and can be tossed in the compost pile after the holiday to minimize waste. Reusable decorations that can be used from year to year also help save money in the long run and of course reduce waste over all. Fantastic way to go green while decorating for the holidays!! Thanks for the great idea! !